Indian recipes usually use red-skinned potatoes. 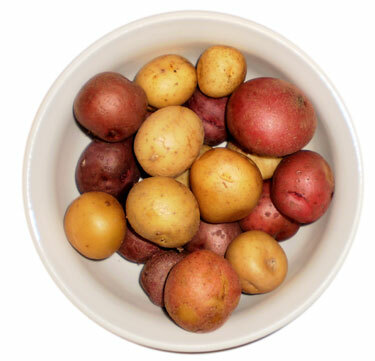 Red potatoes can hold their shape after cooking because of lower strach content. Potatoes are extensively used in Indian cooking. Potato is a recent food in long Indian history. It was introduced around 1600s to India. Within 100 years or so, it was widely cultivated due to its abundant yield with lower effort. Now, potatoes are ubiquitous to Indian vegetarian cooking.